Now on its 5th year, the longest-running Wedding Expo in the City of Imus is back with bigger and better prizes to offer! 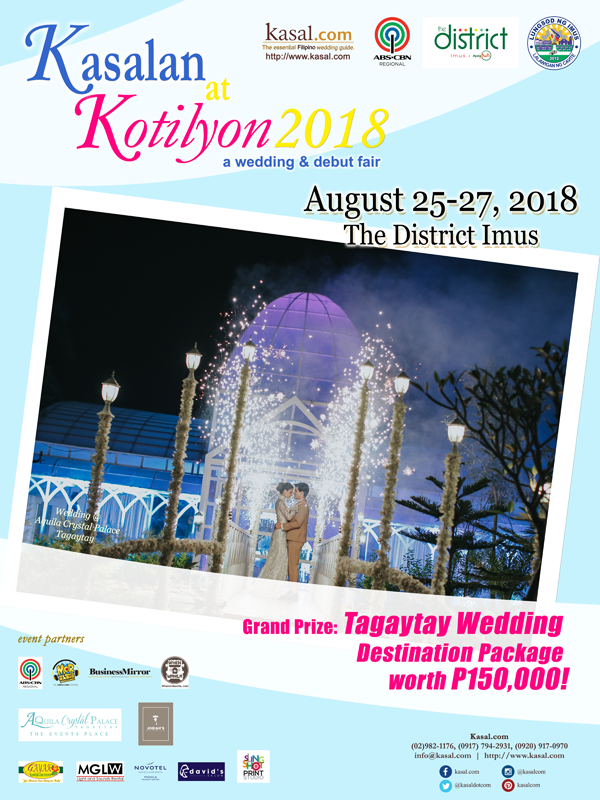 Aside from showcasing the promising wedding & event suppliers from different parts of Cavite, Kasalan at Kotilyon 2018 sa Imus will be raffling off a P150,000-worth of Tagaytay Wedding Package from Aquila Crystal Palace and Josiah’s Catering. There will also be FREE food tasting programs from the different caterers participating, a lovely bridal fashion show by Mitch Desunia with D’ Lady Behind the Scene Make up Artistry, and the annual Kasalang Bayan with the City of Imus Local Government. This August 25-27, join us in The District Mall Cavite and allow us to help you plan your dream event in Cavite. Admission is FREE! Media partners include ABS-CBN Regional Network Group, My Only Radio, Business Mirror, and WHENINMANILA.COM. For more information about Kasalang Filipino national wedding fair roadshow, please call (02) 982-1176, 0920-9170970, email info@­kasal.com or visit www.kasal.com. Like Kasal.com on Facebook – www.facebook.com/kasal.com.